An exploration of the shift from representational art to conceptual art, where process and thought have become more prominent. 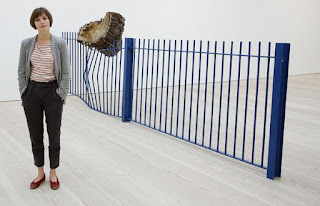 What constitutes art in the present day? Art, as defined by the Chambers dictionary, is “practical skill, or it’s application, guided by principles; human skill and agency; application of skill to production of beauty and works of creative imagination, as in the fine arts; the visual arts, drawing and painting and sculpture; a branch of learning…intended to be decorative or artistic; produced with studied artistry, not arising spontaneously or by chance.” An artist is “a person who practises or who is skilled in an art, now esp a fine art; a person who has qualities of imagination and taste required in art; a painter or draughtsman; a performer” However, I am going to attempt to challenge this in my exploration of what art is and how some art has become more about process and thought, with a focus on conceptualism. The developments in art history have been well documented, but what I am interested in is why art has changed so dramatically over these years and what constitutes art in the present day. What function does art serve in society – or does it need to serve a function at all? I felt it important to understand why I was creating art on a deeper level and to find out where I am placed in art history. Other than being therapeutic I wanted to see if there was something more meaningful to artistic endeavour. Since the development of the camera in the 1800s, there has been question over the demand, or need for realistic art that represents the real world. In the past, artists were sometimes needed to document realistic representations of important people with little – of what we would call nowadays artistic licence. The development of the camera meant that realistic representations of people and places could be captured in a shorter time, and more accurately. However, there are still artists who create realistic pieces of art – yet they are predominantly not at the forefront of revolutionary modern art. 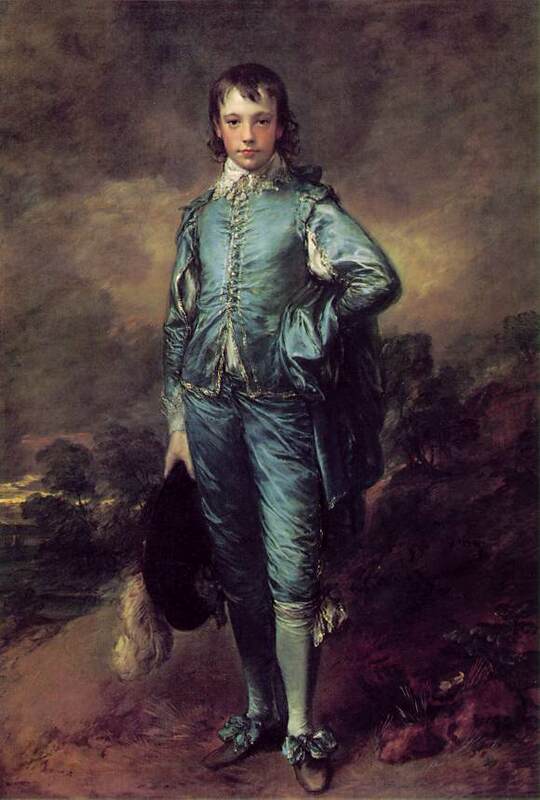 Thomas Gainsborough’s (1727-88) ‘The Blue Boy’ (c.1770) is a prime example of a realistic representational portrait where there is great attention paid to detail. It is of a young, rich-looking boy in a blue outfit. The folds in his clothes are painstakingly painted and observed very closely. The smooth, accurate brush strokes do not give the painting much character but it allows the viewer to be in awe of the sheer realism and life-like quality. It could be argued that photography is now the new representational art. A photographer is often described as an artist, as they have to understand composition, colour and many of the same things that painters have to consider. There are art degrees in Fine Art Photography and it could be argued that there are so many variables in taking a photograph (if doing it manually) – such as aperture, shutter speed and focus – that it is almost as constructed as a painting would be. There have also been new developments in photo-editing programmes such as Photoshop and PaintShop Pro. The manipulation of images can mean that the photograph is so far from the original image, that it is unrecognisable. Artists can inject life into a painting through means such as use of flamboyant line or exaggeration in tone or colour. Jenny Saville (b.1970) manages to create – in my opinion- the perfect balance of accuracy and expression. 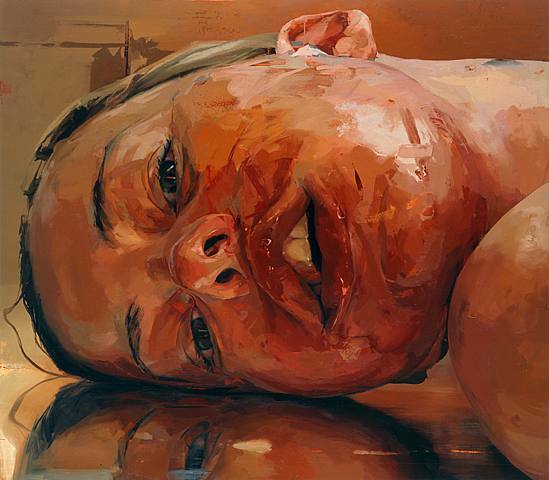 Jenny Saville’s painting ‘Reverse’ (2003) demonstrates this well. ‘Reverse’ is of a woman’s face sideways on a mirror and the reflection. The force of gravity on her face is conveyed very effectively by Saville. The bold brush strokes and lack of blending gives the painting a sense of immediacy and movement as well as being accurate and realistic-looking. 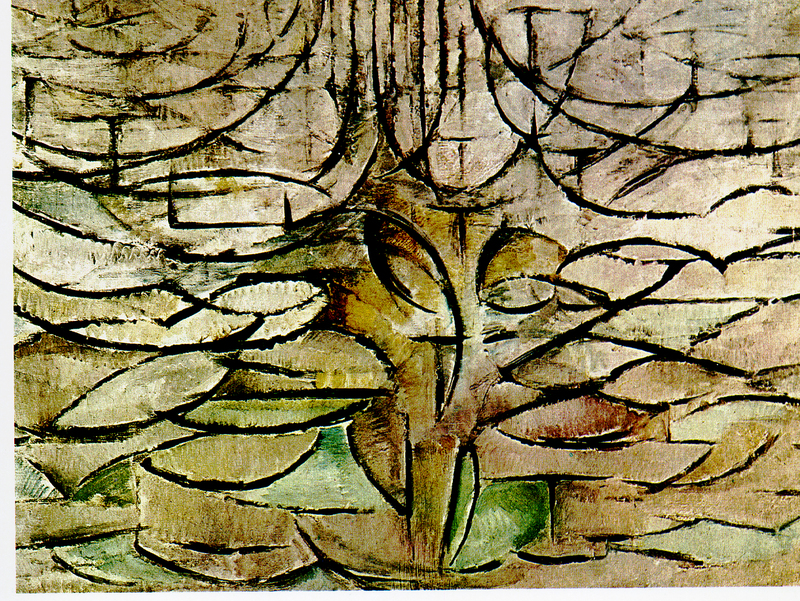 Moving away from exact representations of reality, movements such as impressionism and cubism emerged. 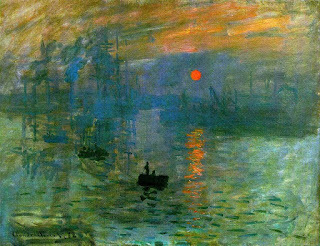 Impressionist artist Claude Monet’s (1840-1926) ‘Impression, soleil levant’ [Impression, sunrise] (1872) creates a real atmosphere and does not go into detail. The main subject of the painting – the boat – is merely a silhouette. Monet conveys the mood in a few quick brush strokes. 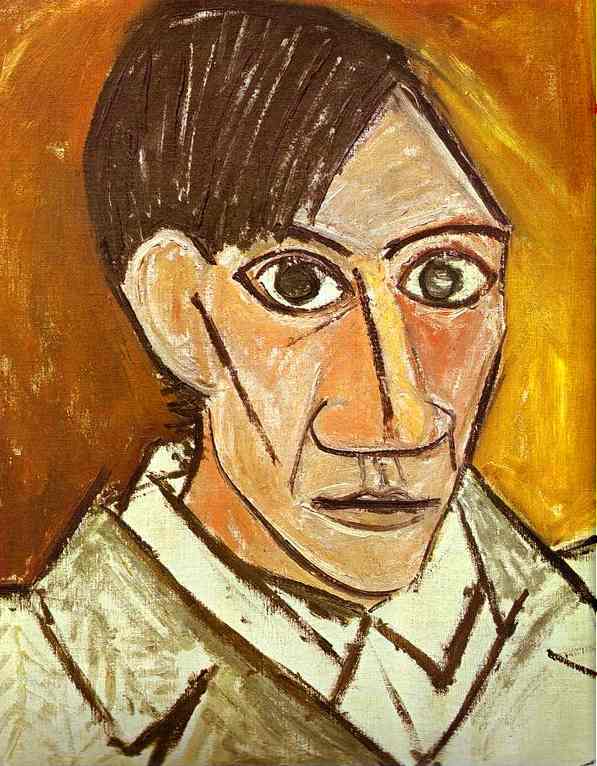 Cubist artist Pablo Picasso’s (1881-1973) Self Portrait (1907) is far from realistic, yet the strong lines and thick texture are eye-catching and the vibrant colours suggest Picasso’s mood. Abstract and Conceptual art are the polar opposite of representational art in some respects, and includes movements such as minimalism, Dadaism, Action Art and YBAs (young Brit artists). All of these titles come under the umbrella of Modern Art. Art Historians disagree about when modern art began – some link it to the French Revolution of 1789; others say it was 1863 when an exhibition of ‘Modern’ art was held in Paris. James Abbott McNeill Whistler’s (1834-1903) ‘Nocturne in Black and Gold – The Falling Rocket’ (1875) - not his most famed work ‘Whistler’s mother’- is an abstracted representation of a falling rocket. There is a complete absence of detail or recognisable objects. 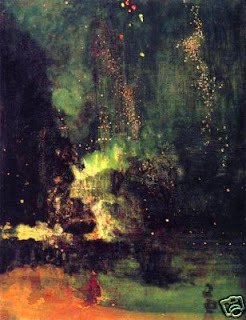 In 1878 Whistler sued art critic John Ruskin (1819-1900) for libel after Ruskin accused Whistler of “flinging a pot of paint in the public’s face”. This controversy over abstract and conceptual art continues to this day. Wassily Kandinsky (1866-1944) was one of the first to stop representing the visible world and to paint less realistic subjects, often linking his paintings to the flow and rhythm of music. He believed that art, like music, should be about emotions, and made colour and shape as important as any subject. 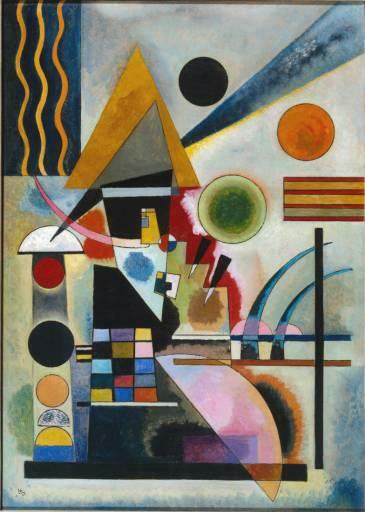 Kandinsky’s painting ‘Swinging’ (1925) is typical of his abstract work. Artist’s own progression from realism to abstraction is probably best illustrated in Piet Mondrian’s work. 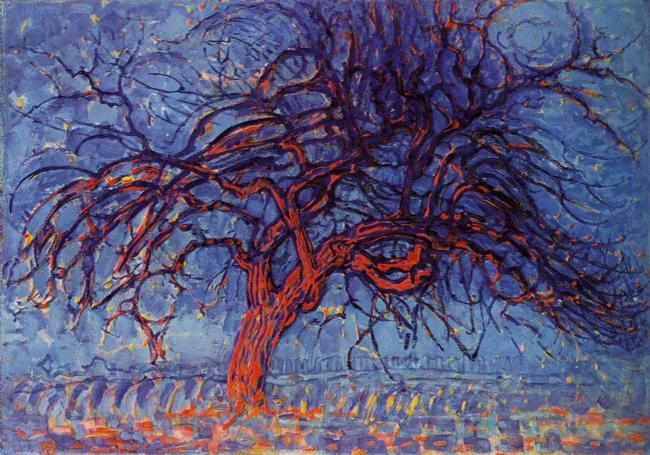 In Piet Mondrian’s (1872-1944) early career, he painted landscapes in soft, muted colours, in a quite realistic way – in pieces such as ‘The Red Tree’ (1909-10). 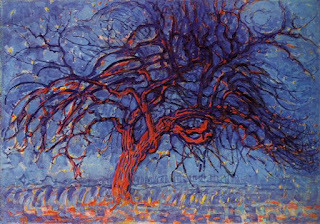 However, Mondrian’s work ‘The Tree’ (1913) is based on his realistic sketches of trees but he reworked the image almost to abstraction, reducing it to a grid, symbolising a balance of physical and spiritual forces. 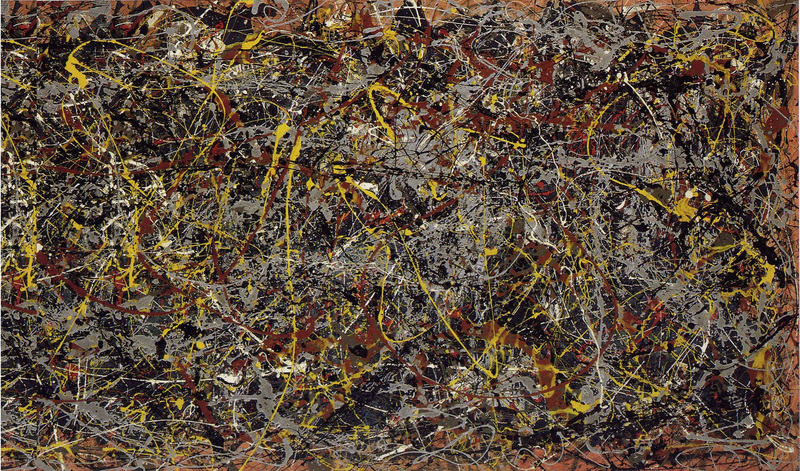 Jackson Pollock (1912-56) was an important figure in ‘action art’. Here, it is the process that is important. Pollock is most famous for his throwing of paint onto canvases in a seemingly disorganised and wild manner – as in his work ‘No.5’ (1948). 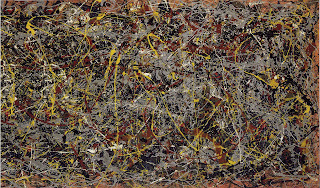 If the dictionary definition of art that says it is “not arising spontaneously or by chance” is correct – then does this mean that Pollock's works are not art? On the other end of the scale, conceptual works have been created with incredibly simple lines and almost clinical shapes. This is called ‘Minimalism’ and is far from the lively works created by Pollock. 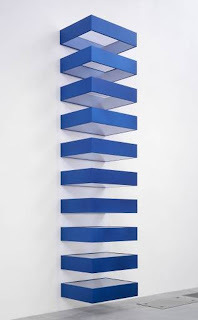 Donald Clarence Judd (1928-94) was a minimalist artist and his work ‘Untitled’(1990) is a sculpture consisting of ten blue hollow rectangles, positioned on the wall much like the vertebrae of your spine. The clean, simple lines and plain colour is devoid of any distraction or elaborate detail. This absence of detail is another way that artists have attempted to evoke feelings and thoughts through art – this time by subtracting distractions and forcing the viewer to see simplicity. Many modern artists seem to have a stronger focus on the concept behind the art, a philosophy or a point to make. 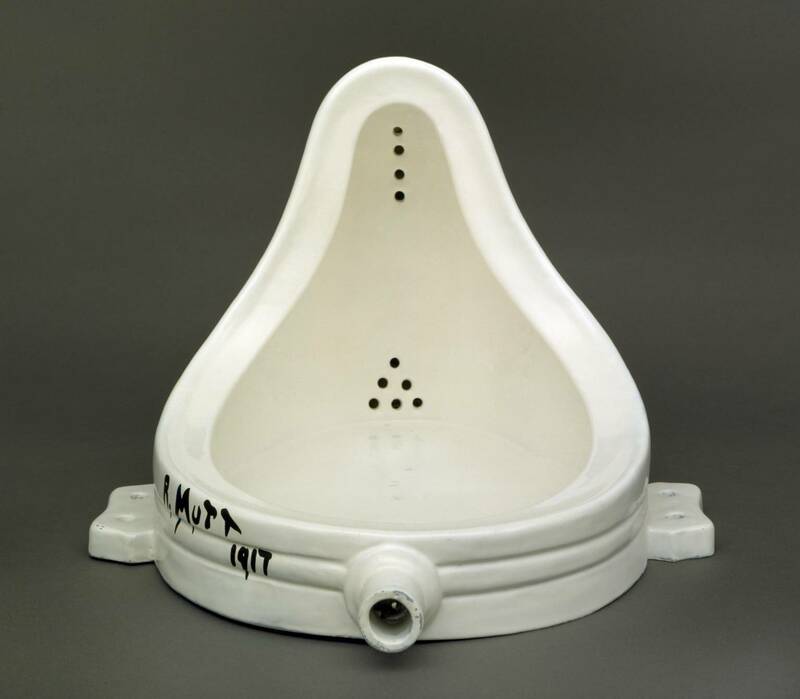 Marcel Duchamp’s (1887-1968) ‘Fountain’ (1917) is a graffiti-ed toilet. This was a reaction to art that - in Duchamp’s opinion - had become too serious. This movement (although he refused to be part of a movement) was called Dadaism. This caused many people to question what art is and whether something suddenly becomes art when isolated and put in an art gallery. Conceptualism arose from Duchamp’s original idea and began in the mid 1960s. Several artists began to exhibit conceptions in the form of drawings, texts or photos for works intended to encourage viewers to participate intellectually in the creative process. In some modern art, there has been an acknowledging the viewer – the viewer as part of the art. René Magritte’s (1898-1967) ‘The Treachery of Images’ (1928-29) is an image of a pipe with the words ‘Ceci n’est pas une pipe’ (or ‘This is not a pipe’, in English). This blatant contradiction catches our attention and makes the viewer pause and think. However, the statement is true, because it is not a pipe – it is an image of a pipe. Magritte forces us to look at the difference between 2D images and confusing it with the real thing. 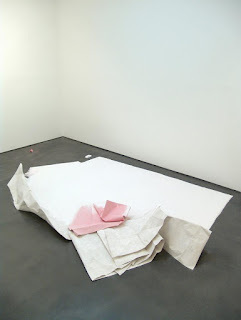 Karla Black’s (b.1972) work ‘Causes Bend’ (2007) is very minimal and one could argue that there was no skill in the construction of the sculpture. However, rather than the skill of the artist, the focus is on the thought of the artist and the mind process – demonstrated in a way that is pleasing to look at. The construction lies mainly in the choosing of materials and the decisions of what should be included or removed. Not, however, in the physical creation of it – there are minimal arranging skills involved. The dictionary definition of art describes it as a “practical skill”, yet here the practical skill is limited – it more about the thought process. 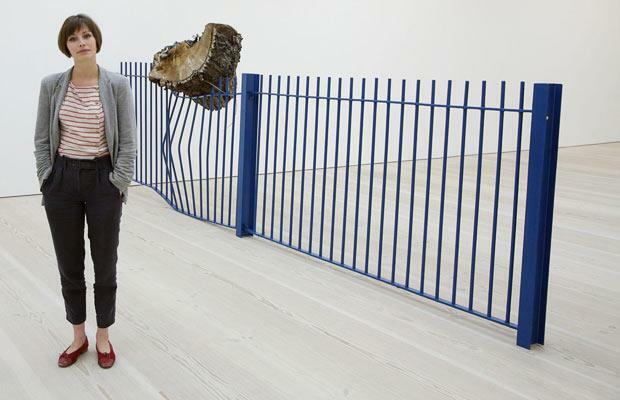 BBC’s School of Saatchi (2009) winner Eugenie Scrase, won with her sculpture ‘Trunkated’. Scrase noticed a fallen tree-trunk that had squashed a blue metal fence and had remained stuck on the fence, propped up by the metal prongs. Although Scrase had not created this occurrence, she arranged for the fence and trunk to be removed from the urban setting to be placed in the art gallery. The decision of her win seemed to be based more on her thought process, creativity, brazen nature, and charisma than on any traditional artistic skill. This theme of the artist’s character itself being part of the artwork, is seen elsewhere with Damien Hirst’s (b.1965) ‘The Physical Impossibility of Death in the Mind of Someone Living’ (1992) which consists of a large pickled shark. 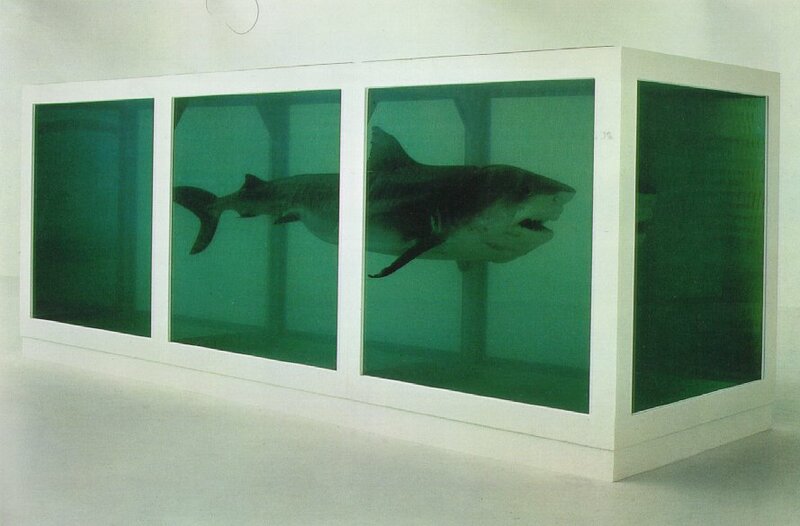 As well as being a tool for thought and reflection, and looking visually striking, we are in awe of Hirst’s shamelessness. Tracy Emin’s (b.1963) ‘My Bed’ (1998) is a piece which consists of an unmade bed in the centre of an art gallery. 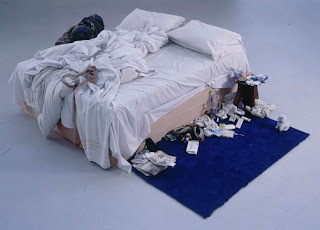 The extent of the mess has led to critics explaining it as a piece that shows Emin’s depression. However, the piece sparked controversy when nominated for the Turner prize – many felt that an un-made bed could not possibly be art. The effect on the viewer, that conceptual art has, can differ greatly. With Hirst and Emin especially, the effect predominantly seems to be one of shock, yet with most of Black’s work, it has a calming quality. The emphasis seems to have shifted for many modern artists. From being merely something to commission to re-create a scene realistically or to imagine a scene according to pre-conceived ideas - to being people who think about life and share wisdom or thoughts. These thoughts are expressed visually – so a visual awareness is still needed. Often, due to the lack of words, these thoughts are not particularly well-explained. Yet, this is probably because the many things in life that art deals with, cannot be expressed through words. Some modern artists are almost philosophers with a visual awareness. This demands a higher expectation of the viewer and artist and also changes the power and role of the artist. Art can now be a tool to interact with the viewers and to challenge them. 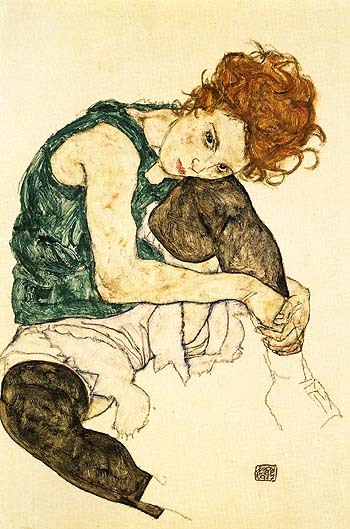 Egon Schiele’s (1890-1918) ‘Seated Woman With Bent Knee’ (1917) is an almost illustrative painting of a red-haired woman. Schiele’s use of thick paint, punchy colour, quavering line gives a distinctive style. He also understands the impact that the absence of colour can give and how a little transparency can give a mysterious ghost-like quality. Shiele’s paintings often have a lot in common with illustrations. For example, fashion illustrator David Remfry (b.1942). The line between illustration and expressive painting is ever bending. The boundaries between the arts are becoming more difficult to define. When does a really thickly painted painting become a sculpture? 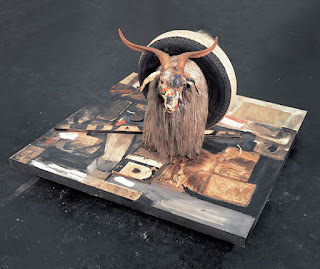 This is explored by artist Robert Rauschenberg (1925-2008), and is especially apparent in his work ‘Monogram’ (1955-59). The canvas although painted on, as is the traditional manner, has a model of a sheep attached. This sheep has been painted on, as if it were an extension of the canvas. Therefore it is difficult to define whether the piece is a sculpture or painting. Or when does photo-editing turn a photograph into an expressive piece? There are also cross-overs between the arts: such as art that includes language, art that incorporates music, music that incorporates art, music that is also poetry, poetry that is also drama, drama that is also an artistic visual spectacle. Mondrian’s ‘Broadway Boogie-Woogie’ (1942-43) is an abstracted piece that is supposed to reflect boogie-woogie style music, as well as representing Broadway in America, from above. The blur between the arts and between the artistic movements has become more so. Art’s place in society is ever changing and I think that this progress towards more abstract and conceptual pieces is a positive thing. Art that is more about process and thought is considerably more interesting than straightforward paintings. Although I approve of conceptual art, this does not mean that I do not appreciate straightforward works. In fact, I think that without these initial works, we would have nothing to build on, and the meaning and depth of visual awareness gained from straightforward painting is essential before progressing to more experimental works. 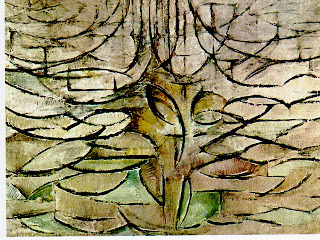 Artists such as Piet Mondrian demonstrate this perfectly, with his clear development from realistic to abstract pieces. The statement that art is something “guided by principles” can also be contradicted. Artists such as Duchamp, and Black do have basic principles behind their works, or points to make, but equally artists can function without this. 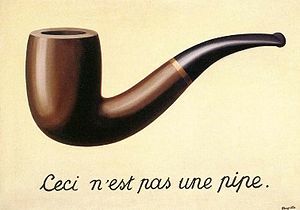 Magritte seems to express what art is in the most succinct manner: “Ceci n’est pas une pipe”. Art is a representation of something (the pipe), that it isn’t (a pipe). As for the need to represent something that it is not, I am inclined to agree with Théophile Gautier in that ‘art is for art’s sake’. I therefore conclude that Art is any form of expression or representation of something that it is not, and that conceptual and abstract art are merely an extension of this. Arts’ place in society is one of great importance, as without it we would not think or reflect, and without that our society becomes a stagnant one where we are not used to questioning the status quo.